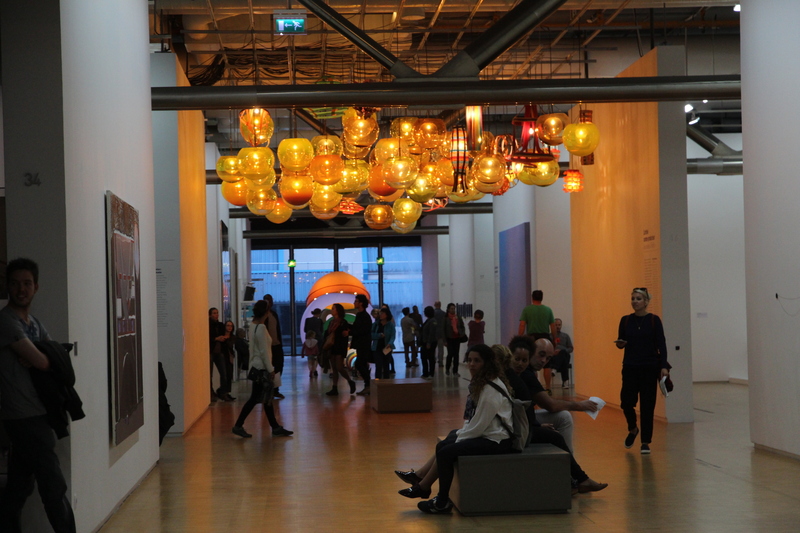 France and Georges Pompidou helped me find a way to love modern art | Where to next? I’ve never been a huge fan of modern art. It’s okay, but I don’t feel the need to rush out and see it. That all changed when I visited the Musée National d’Art Moderne in Paris. Located in the Centre Georges Pompidou, it is Europe’s largest museum for modern art and it absolutely blew me away. Room after room, piece after piece, I finally found a true love for modern art. In reality, the love affair began when we were still waiting in the queue to go in. The building, which was commissioned by Georges Pompidou when he was president of France from 1969 to 1974, has its innards on the outers. Yeah, you read right. The centre has been built inside out. The plumbing, escalators, ducting, pipes, air vents, stairs and all the other normal guts of a building are on the outside. That seems to work because there’s plenty of amazing stuff reserved for the inside. In addition to all the modern artworks, the 7-storey structure houses a public information library and a centre for music and acoustic research. Anyway, we had plenty of time to admire the exterior. We chose to go on the first Sunday of the month when admission is free. The queue was long, but there were plenty of buskers (including a woman playing the didgeridoo) and ice cream sellers to help pass the time. But in the end, we didn’t wait all that long. The only hold-up was to make sure everyone passed through the airport-style metal detector, where I think my underwire bra set off the alarm. Oops, sorry, too much information. And then we were let lose to travel up the escalators to the roof to see the great views of the Eiffel Tower (in one direction) and Sacred Heart (Sacré-Coeur) Basilica of Montmartre (in another). Then it was back to levels 4 and 5 where the modern artworks awaited. 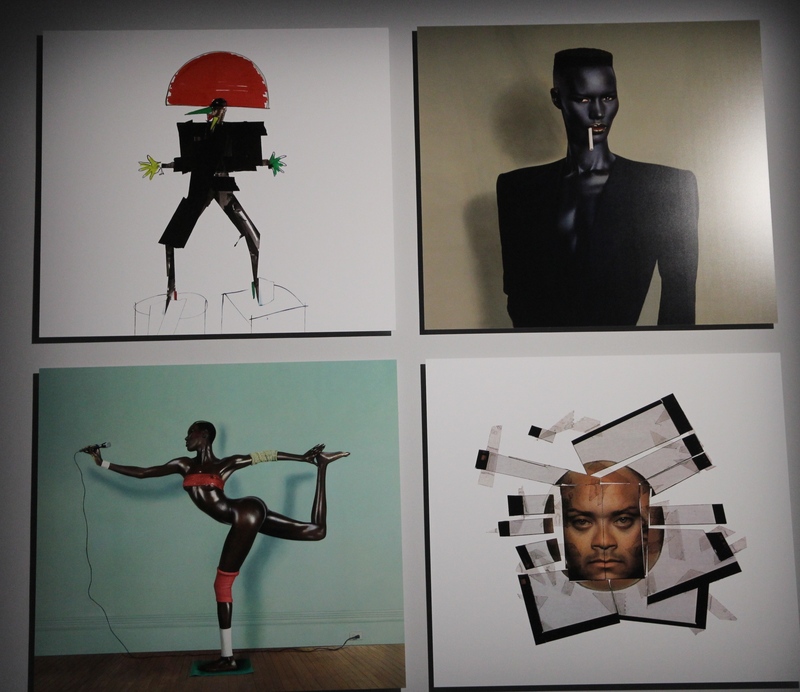 One of the most riveting pieces was a video and collection of stills by Jean-Paul Goude. Singer Grace Jones features in these, and I have to admit that I watched the video through twice. Absolutely spellbinding. So many images, so many themes, so much to look at. But there are so many other noteworthy pieces. I loved an unknown-to-me piece by Picasso, especially because a mum lifted up both her sons to show the piece to them. 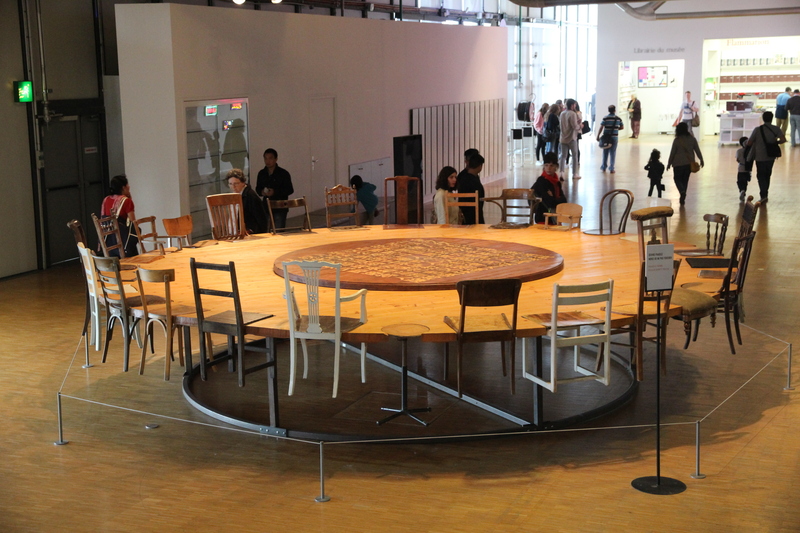 And then there were the wooden chairs at the round table, wrapped globes, hanging glass and…and…and! Just go if you get to Paris. You can bet I’ll go again when I return. First an embarrassing confession! I’ve been to Paris four times since the Pompidou Centre opened in 1977, and this is the first time I’ve ever gone inside. So I’m giving myself a huge kick up the bum for being so remiss. Three main architects—Renzo Piano and Gianfranco Franchini of Italy, and Richard Rogers of Britain—designed the centre. They won a competition that was, for the first time ever, open to international architects. Early reaction to the structure was negative. National Geographic called it ‘love at second sight’ and an Italian newspaper said Paris had created ‘its own monster’. Today’s opinions are much kinder and more positive. That’s my opinion, but plenty more agree. When it was built, the centre expected to have 8000 visitors a day. In its first two decades, it had 145 million visitors, more than five times the predicted number. And attendance continues to be on the increase. So go if you ever get to Paris. Please go! And you’ll be surprised to know that it doesn’t seem crowded. My pleasure. It really is worth a visit. Yes, definitely worth a visit. The video must be new. The still components have various dates, but I think the video is dated 2014. A beautiful place to take your time. Love the photos of the young mom. 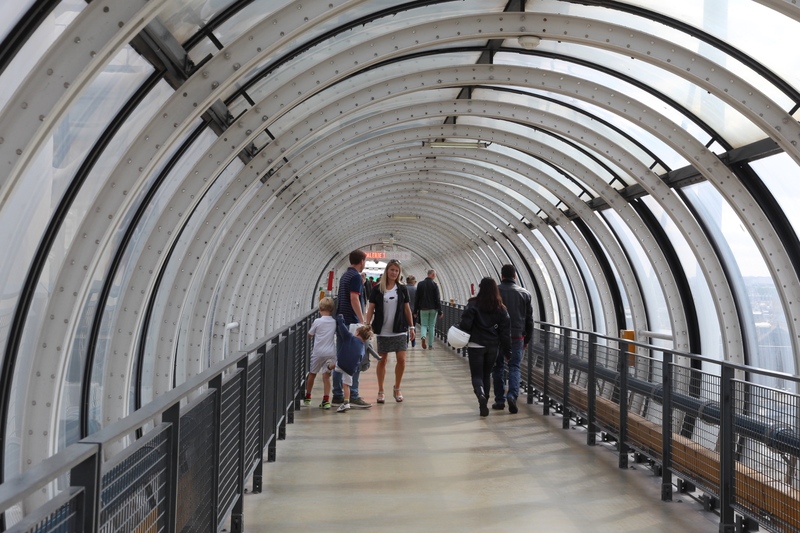 The Pompidou deserves a lot of time—and a good mum to accompany you. I can well see how that place changed your opinion of modern art. I’ve never been a fan of modern art, either, but your post and beautiful photos are very persuasive. I’m fascinated by your description of the outside, too. I didn’t love everything there, but there was a lot to love anyway. It is a fascinating place that’s for sure! I”m not really a fan of modern art either but you’ve convinced me to visit the Centre Georges Pompidou! It’s really worth your time. Great post – love that the building is “inside out”. Next time Peggy, you might wear your underwire bra on the outside of your clothes . . .
That’s a brilliant suggestion! Don’t know why I didn’t think of it? She was gone when we left. But the area always has a lot of buskers. There was even a ‘comedian’ speaking to a crowd. I’d loved to visit again and see how the exhibitions change. And I agree, I think what we like often depends on what we’ve been exposed to. I love modern art and would love to visit. The museum of Modern Art in Madrid is fabulous. It is located in an old psychiatric hospital and that adds to the spooky vibe. Thanks for the tip. Now I’ll have to go back to Madrid. I never thought modern art was interesting at all! This is so cool! I loved the pictures of much of the art! I also think the building is amazing and unique! If I ever go I will sure go to this museum! thanks for the tour! I loved the art, I guess I had my own ideas of what it would be like and it was much different! I used to think most modern art was those paintings of all black or all blue. I don’t get that stuff. 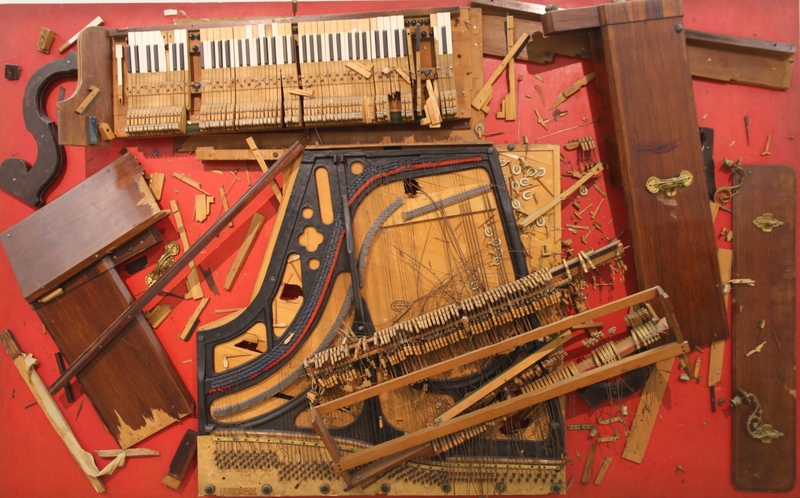 I’ve never been a big fan of modern art either, although there are some pieces there that seem fascinating! I was overwhelmed by the styles and variety of the pieces. There was something for everyone to love. I like this building and love the Museum. Recall seeing group of kindy children sitting attentively in front of a painting as it was being explained to them. It really is the kind of place where you want to sit and listen and learn. Once again, Peggy, you have written an article that makes me want to catch a flight to Gay Paree. Such an amazing place!! First we started laughing at some of the exhibits when visiting few years ago, but then we fall in love for this unique and wonderful museum! Happy travels Peggy! It is a wonderful museum. We returned the other day. I have never been there but want to go now! It’s absolutely wonderful. Hope to go back later next week.